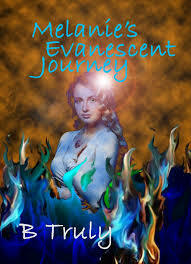 B Truly will be on tour July 6-13 with her novel Melanie's Evanescent Journey. This one was really interesting. I understand that it is a companion novel to the first in a series, but could be read as a stand alone. I loved the premise and was super intrigued by the story line. I thought that high school senior Melanie portrayed very realistically and well. She was shallow and possessive but still had her head on straight enough to realize that she needed to do well and go to college. While the majority of her time was spent with Jason, she still did things for herself and didn't completely blow off Ebony, which is always nice to see. I did roll my eyes multiple times when the different songs were being described and the fact that Melanie was a self-proclaimed Twihard made me cringe, but it didn't detract from her character. It just served to make her more real and the story more complex. One of the things that I did not enjoy was the dialogue. It felt stiff and not as though it was something people would actually say. It was used more to describe what was happening rather than to have the characters get to know one another. It seemed as though every piece of dialogue was filler because it was used for so many aspects of the story. I did think it wrapped up a little too nicely and I would have liked a bit more conflict before coming to the overall conclusion/epilogue. But I was happy that some of the stories wrapped up nicely and neatly (since I am aware that there is a sequel so I am assuming that there is more to some of the stories). Overall: 3/5. I thoroughly enjoyed this one. I just would have liked a little more. I have wanted to be an author since I was fifteen years old and grateful to have accomplished this dream. I have three wonderful children and a husband who defines the person I am today. I work as an Ultrasound technologist in Sugarland, Texas and enjoy this field. I have very vivid dreams and a wild imagination. I like to read and watch tons of television shows and movies. I’m addicted to romance and get a thrill out of suspense. This Companion novel to the Sonar trilogy is a combination of both aspects. It was fun to explore different elements of Paranormal romance. I want to show my readers that paranormal romance can be fun, but also traumatic.